Whether you need a white suit for men for a costume or just because you have a Summer time event coming your way, you can always guarantee that an all white suit for men have a visual way of getting you noticed. Sure you can wear other suits to work, but the color white has never been a business color but special occasion color. 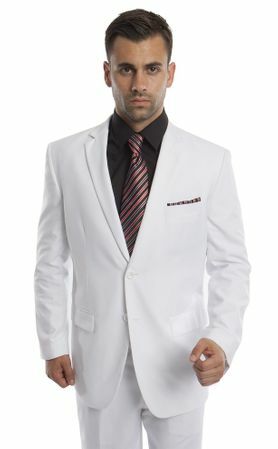 This classy style white suit for men has that classic regular fit that is designed in Italy with a double vent style jacket with notched lapels and flap style pockets. The pants are flat front no pleat design that are ready for hemming. Made of fine poly/rayon super 150s by Tazio.